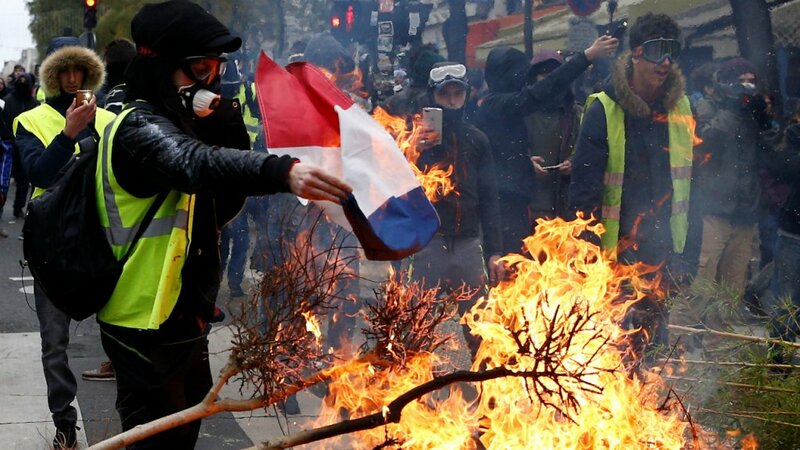 For over a month, Paris and many other cities in France are reverberating with the march of the Yellow Vests, angry mass of militant protesters denouncing the government as pro-rich and anti-poor, asking President Macron to resign. 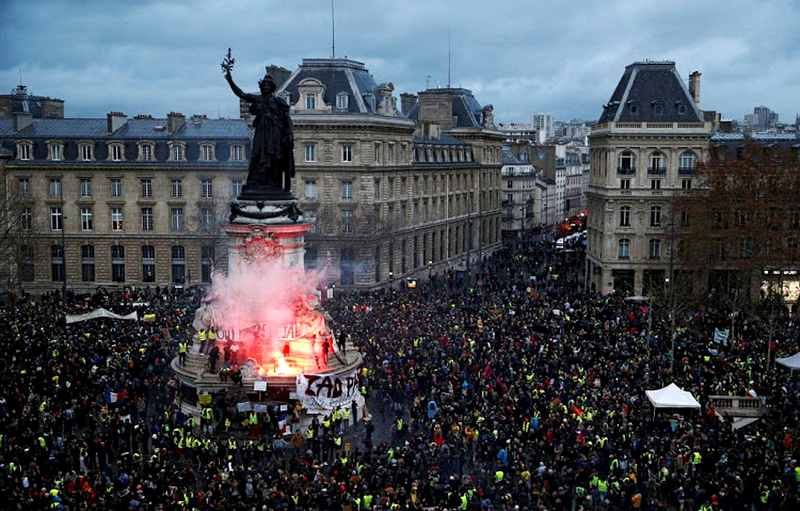 This introductory article by Sushovan Dhar tries to understand this people’s uprising and revolt which has scared the neo-liberal regime across Europe. The Parisian streets are once again full of a familiar fragrance with the potential to transform this winter of despair into one of hope. Angry protests rock the rues and pavements with more and more people joining the yellow vest movement. This resistance, with its signature yellow coloured roadside safety vests used by motorists, has brought together people from across the political spectrum angry about economic inequalities and declining consumption power. The ghosts of 1968 evoked in its 50th anniversary? Certain analysts are alarmed to see the worst violence to hit the French capital in 50 years. However, none could dare to deny that there is certainly a widespread societal disenchantment with the declining standard of living in France. One can debate about the nature of the movement and its capacity to shape the political situation but, as Alain Krivine one of the important organisers of May 68, observes that the similarities lie in the expression to refuse the authorities of the ruling dispensation. There are other similarities including the strong rejection of parties and unions, a lack of organization and strong feelings of dejection. On the other hand, a strong youth movement yearning for change, the hallmark of 68, is still absent. They (the protestors) have to seize this ever-increasing anger. 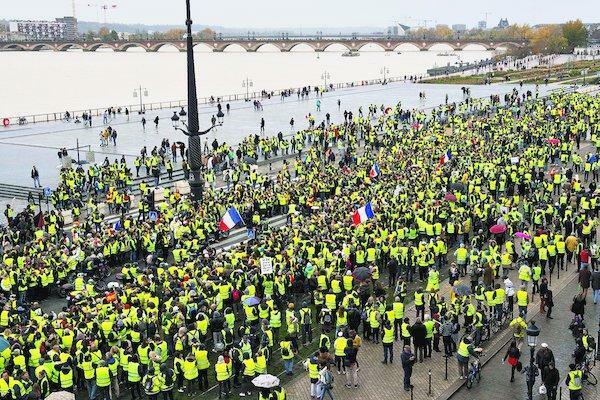 On November 17, simmering anger turned into active participations as people in France mobilised on the streets to protest sharp fuel hikes on petrol and diesel levied under the pretext of reducing emissions. The tax, approved in 2017, raised the price of petrol and diesel. These taxes, combined with an oil price hike in last October hit citizens very hard. The protests did not stop at these taxes but were directed with vigour towards the rise in prices of the general commodity, rents, gas, health insurance … while wages remained frozen for years, the retired suffering from the reduction of pensions and other social securities. The government repeatedly parroted about an increasing purchasing power but with a few takers. Hundreds of thousands of protesters responded. A petition that began circulating online in May to lower fuel prices generated over 300,000 signatures by mid-October and largely organised on social media, the protests exploded without any clear leadership. Roads and highways, fuel depots, shopping centres, and some factories were blocked as around 300,000 people took part in the first demonstration, all across France. The protests soon met police repression and turned violent which mainstream media was quick to seize in order to vilify and divert the popular attention. A video went viral in the social media exposing the police repression on the protesters. Even a passer-by was repeatedly beaten by helmet-clad corps during the demonstration on 1 December. After being subjected to several baton charges and kicks, the victim had to be hospitalised and undergo an eye operation. However, the media chose to portray the images of a policeman hit by a group of yellow vests. This, the authorities claimed was an evidence of extreme violence unleashed by the demonstrators. Castaner, the French home minister was quick to castigate the movement for being a terrorist act, hell-bent on creating lawlessness. However, neither he nor the media were able to hide the reality and denigrate the revolt. Rather, the French government, in order to pacify the demonstrators, when all attempts at quelling them failed, declared no fuel price hike for, at least, the next 6 months. This marks the first major bowing down by President Emmanuel Macron’s government after one and a half year in office. Along with the postponement of the tax increases that were set for January, the French Prime minister promised help to the working poor and squeezed middle-class. The French government went one step ahead and declared that it will consider the reintroduction of a tax on high earners which Emmanuel Macron abolished after winning the elections in 2017. This was also one of the demands of yellow vest protesters after the movement expanded beyond the demands of fuel price hike. Ending the ISF wealth tax on high earners was a key part of Macron’s pro-wealthy presidential campaign, seen as a friendly signal to the capitalists and other elites. This solidarity tax, unlike the other fiscal measures, is based on wealth and not the income. Fiscal households, with assets only above Euro 1,310,000 comes under this tax bracket. 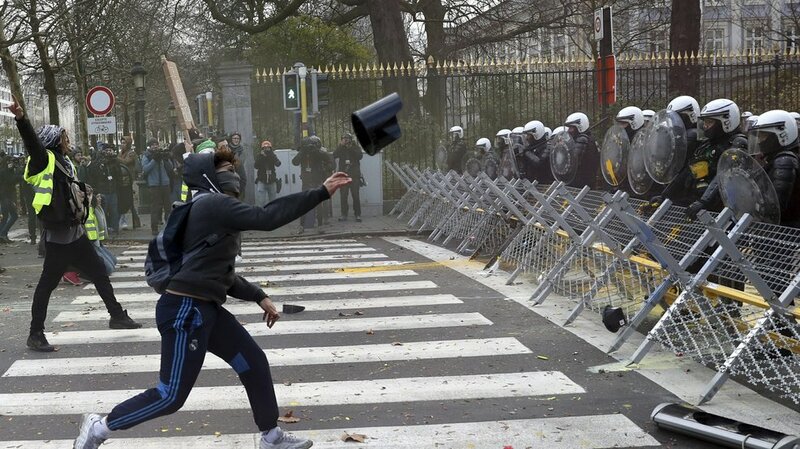 Little wonder the protests have spread to Belgium. The Belgian police resorted to random arrests and firing water cannons to disperse protesters in Brussels on 30 November. In Serbia, a deputy for the opposition party warned the parliament of yellow vest movement on the streets of Belgrade and Serbia if gas prices are increased. Latest news indicates that this movement has also spread to the Netherlands and the Egyptian authorities have restricted the sale of yellow reflective vests, apprehending French-style protests during next month’s anniversary of the 2011 Tahrir square popular uprising. The French Prime Minister, Edouard Philippe is desperately trying to douse the fire that his government lit. It is clear that he is playing tactics to bid time. The six-month suspension of the fuel tax increase means that he doesn’t want to give up but, postpone the decision for some time. These measures are far from a genuine response to the anger of the popular classes or their demands for fiscal justice or an end to declining living standards. The demands are also larger, and political in nature, as shown by the slogans demanding Macron’s resignation. This government is seen as illegitimate and it will not be able to end the crisis with some very limited and temporary measures. 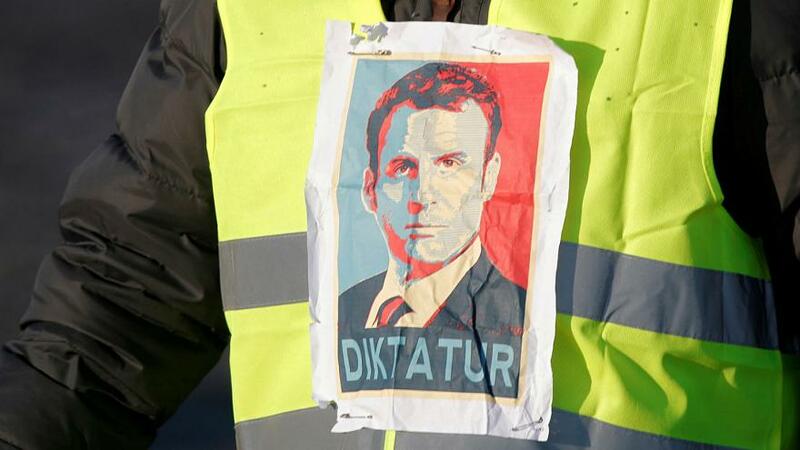 On 10 December, Macron attempted to mollify protesters announcing an increase of minimum wage, an exemption from taxes on overtime pay, and an exemption on certain social security taxes for retirees who earn less than 2,000 euros, a month but something is still rotten in the state of France. Globally, indirect taxes, viz. VAT and GST increased following the crisis of 2008. The average rate of indirect taxes peaked at 21.5% in the EU and 19% in the OECD. These taxes fall on the consumption of goods and services that make up a larger share of the budgets of poorer than richer households increasing inequality in society. It’s important that we pay attention to the class nature of taxation policies and the pervasion of indirect taxes given the growing income inequality, unemployment and poverty, not only in France or in Europe but, in almost all societies. The social contract legitimises state authority for the accomplishment of social justice, a working economy, security, etc. To legalise and guarantee this obligatory role, the states are bound to put in place enabling policies and raise resources through a taxation system. It is observed that instead of equitable and progressive taxation systems, the states are resorting to regressive taxation regimes in the midst of an ever-expanding unemployment, inequality and hyperinflation. It is worth mentioning here that Petroleum fuel prices in India have sky-rocketed in recent times, shattering all previous records. A major portion of the price of fuel comprises of indirect taxes viz. central excise and custom duties and sales tax imposed by state governments. The common consumers and small producers and allied industries have to bear the burden of this excessive taxation. Earlier this year, truckers across the country had gone on strike protesting against the hike in diesel prices, among other things. In general, there has been a steady rise in Indirect taxes (net of subsidies) in recent years in India, pushing up retail prices of commonly used goods and services. According to data from the CSO, net indirect tax collection (centre and state combined) grew at a compounded annual growth rate (CAGR) of 22.3% in the past three years, against 10.6% annualised growth in GDP at current prices during the period. This trend of higher indirect taxes, having a bigger impact on the wallets of the poor and low-income families, to raise additional revenues is likely to continue as various indirect taxes have been replaced by the GST. The question of fiscal justice remains central in our quest to address inequality. 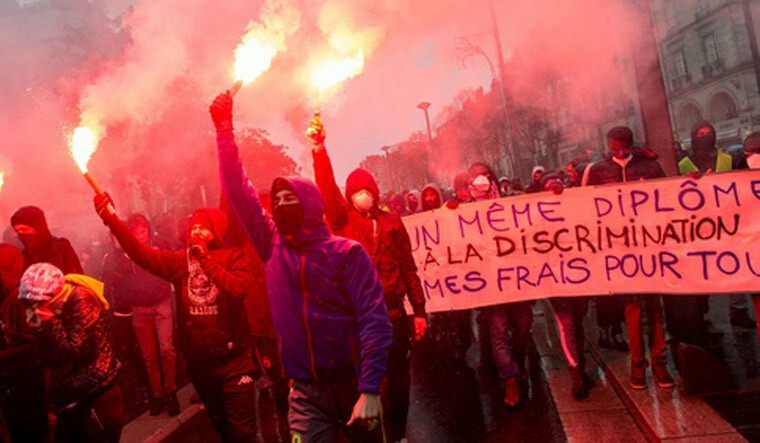 As Le Monde Diplomatique observes “in the past few years challenges to the taxation system have gained such momentum that tax has become a central issue in the anti-austerity struggle. In Portugal, in May 2010, tens of thousands of people demonstrated against tax rises and spending cuts. Two years later there were big demonstrations in Spain against austerity, privatisations and higher VAT (on school supplies, for instance, it increased from 4% to 21%). In Greece, public and private sector employees took to the streets in protest at lower salaries and unfair taxes. And in 2013, French food plant workers facing redundancy joined forces with the ‘Bonnets rouges’ (‘red caps’) movement launched by farmers and small business owners to defeat an eco-tax on heavy goods vehicles.” The yellow vest movement follows the same orientation. The movement continues with renewed vigour joined by the youth gearing up for the next weekend of actions. It has become a point of convergence for different kinds of discontent. Only time can tell us about the future of the mobilisation. Barricades across France? A general strike? Nevertheless, faced with an uncertain future, the people are convinced that they can collectively force Macron to give in. Put an end to unjust taxes, make the rich pay, increase wages and incomes. The author is a Kolkata-based political analyst and activist. Photos are courtesy internet.